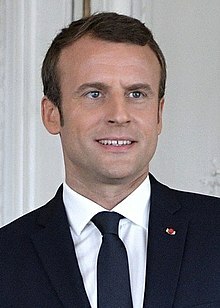 Emmanuel Macron (French: [ɛmanɥɛl makʁɔ̃]; born 21 December 1977 in Amiens) is a French politeecian, senior ceevil servant, umwhile investment banker an current Preses o Fraunce. In November 2016, Macron declared that he would staund in the election wi En Marche!, a muivement he foondit in Aprile 2016. He wan the election, an is Fraunce's youngest Preses, takin affice at 39 years o age. This page wis last eeditit on 2 Julie 2017, at 17:33.